[SatNews] Amazing images reveal NASA's Wide-field Infrared Survey Explorer, or WISE, which captured this colorful image of the reflection nebula IRAS 12116-6001. This cloud of interstellar dust cannot be seen directly in visible light, but WISE's detectors observed the nebula at infrared wavelengths. 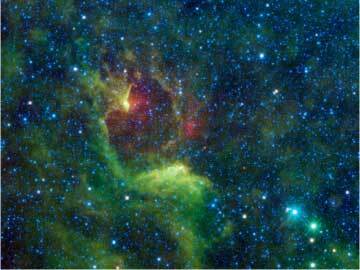 In images of reflection nebulae taken with visible light, clouds of dust reflect the light of nearby stars. The dust is warmed to relatively cool temperatures by the starlight and glows with infrared light, which WISE can detect. Reflection nebulae are of interest to astronomers because they are often the sites of new star formation. The bright blue star on the right side of the image is the variable star Epsilon Crucis. In the Bayer system of stellar nomenclature, stars are given names based on their relative brightness within a constellation. The Greek alphabet is used to designate the star's apparent brightness compared to other stars in the same constellation. "Alpha" is the brightest star in the constellation, "beta" the second brightest, and so on. In this case, "epsilon" is the fifth letter of the Greek alphabet, so Epsilon Crucis is the fifth brightest star in the constellation Crux. Crux is a well-known constellation that can be easily seen by observers in the Southern Hemisphere and from low northern latitudes. Also known as the Southern Cross, Crux is featured in many country's flags, including Australia, Brazil and New Zealand (although New Zealand's flag does not include Epsilon Crucis). The colors used in this image represent specific wavelengths of infrared light. The blue color of Epsilon Crucis represents light emitted at 3.4 and 4.6 microns. The green-colored star seen beside Epsilon Crucis is emitting light at 12 microns. This star is IRAS 12194-6007, a carbon star that is near the end of its lifecycle. Since the infrared wavelengths emitted by this star are longer than those from Epsilon Crucis, it is cooler. The green and red colors seen in the reflection nebula represent 12- and 22-micron light coming from the nebula's dust grains warmed by nearby stars.